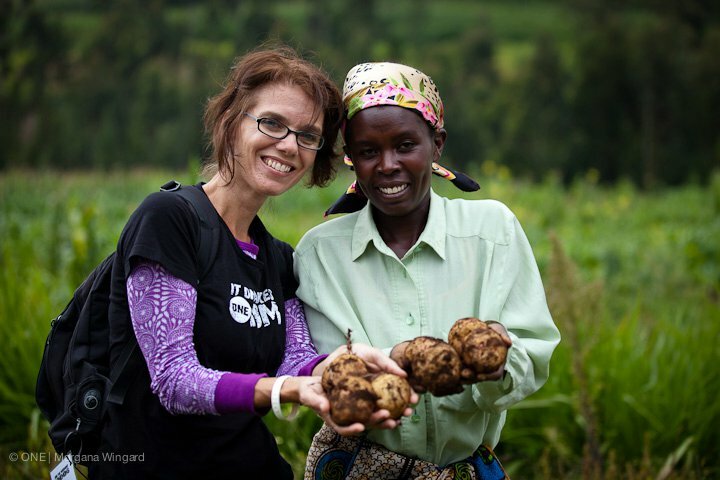 Imagine being a mom standing on a small farm in Elburgon, Nakuru County in the country of Kenya on the continent of Africa learning about Irish potatoes. You are welcomed with celebration and surrounded by the most beautiful countryside. There is so much to take in that at times it can be overwhelming. Then the farmer begins to demonstrate how she peels her potatoes and you discover that she does it EXACTLY like you! That is where I found myself today and I was invited to peel potatoes with Grace. Grace is a member of the Mastima Potato Growers Self Help Group started in Septermber 2010 with the aim of marketing Irish potatoes. The Irish potato is the second most important food crop in Kenya and has the potential to yield over 80 tons per acre, which would dramatically increase food security, farm income, and nutrition. Located far from markets and without the availability of planting materials (seeds) their ability to even feed their family can be difficult. Programs like Feed the Future provide these farmers with the tools needed to feed themselves. The Feed the Future initiative ran under USAID takes a holistic approach and incorporates in; agriculture research, access to finance, farm inputs, natural-resource management, market development, and advocacy for farmer-friendly policies. It is important to know that these farmers have big aspirations. During our welcoming presentation the committee chair was aware of the crisis happening in north-eastern Kenya and not only was the goal of their cooperative to feed their community, but they have in their long-term plan to feed their entire country! For the remaining tour of the farm I could not leave the side of Grace. She glowed each time we discovered a new crop. She showed me her bananas, maize, cabbage, and her favorite-potatoes! She let me dig in the dirt with her and carry them back to storage. We laughed, we hugged, and she asked when we could see each other again. Programs like Feed the Future are giving hope to these farmers and must continue to be supported. If I have learned anything this week it is that the world is a small place and that we can find our connection in something as simple as peeling a potato.